With any special occasion, you want your guest to be happy and to give them a day to remember so why not add those finishing touches to your party, wedding, christening, fete or whatever the occasion by hiring a popcorn and candyfloss machine. We all know how much children and adults love popcorn and candyfloss, so why not treat them to these scrumptious treats. We will supply everything you need on the day and if you would like a specific colour or flavour candyfloss then let us know. You can choose between sweet and salt popcorn or a mixture of both which is now becoming very popular in the shops. These will give your guests something lovely to nibble on throughout the day. 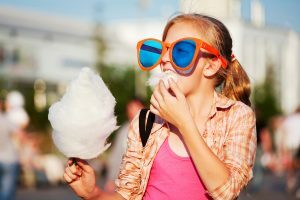 Here at Bizzy Bouncers, when you hire a candy floss or popcorn machine, we will provide you with the best vintage cycle possible so that you can show off at your wedding, party or function. We think it is only right that you should enjoy the day with your family and friends, so we will provide you with attendants or operators, who will be dressed appropriately and will combine their efforts with providing delicious tasting treats to your guests. Scrumptious and memorable – our candy floss and popcorn hire is second to none and the trike not only looks fantastic but is available for up to 4 hours hire. Choose the popcorn, the candy floss or even both and as you can see on our website, we also hire a slush machine. You could combine all 3 and really treat your guests to something special. 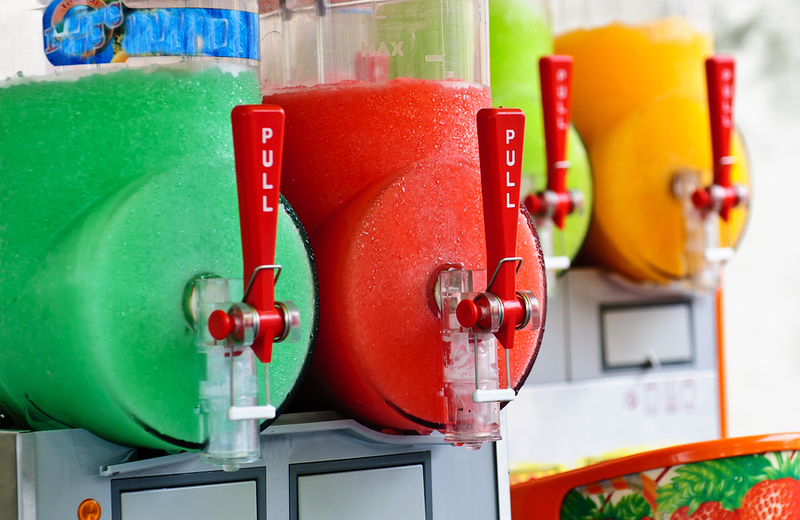 Our slush machines are very popular no matter what the weather is like. If you are having a birthday party, christening, wedding or a charity event in your local school then hiring our slush machine would be ideal. You can choose how many different slushes you would like. There are many different flavours and colours to choose from. The children would love these and you could recommend that they try all the flavours together. It looks pretty and will taste amazing. For any information you need on our slush machines, please contact us today. Truly scrumptious and very retro, the kids and adults will absolutely treasure the memory of slush at your function, be it a wedding, party or corporate occasion. Perhaps you will combine slush hire with our candy floss or popcorn hire? If you do have the budget this is a great way to keep your guests entertained with a retro or vintage feel whilst offering them snacks and non-alcoholic beverages. A great way to entertain the children at your event too. For any information you need on our slush machines, please contact us today.